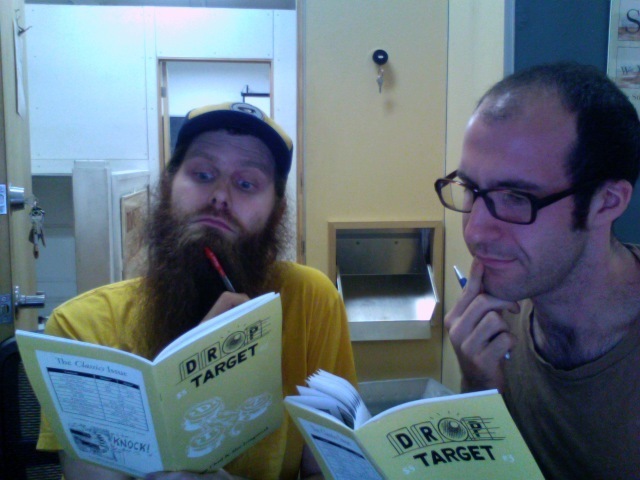 Tonight we finished the first proof copies of Drop Target #3! In an unprecedented move, Jon and I are going examine the books for a WHOLE NIGHT, to look for any errors, BEFORE printing. Tomorrow we'll be slinging paper in the lab, and the book will debut at SPX September 10th and 11th in Bethesda, Maryland! Also, things are going to be CRAZY around here with the start of the semester and SPX, so it looks like it won't be available until AFTER the show. Really, that's the soonest that we will actually have time to fill all the orders, etc. etc. Sorry for the delay, but please know that it will be worth the wait! This issue is a zinger! It's off to proofreading we go! Sitting in front of the computer, working on Drop Target #3 - the Classics issue! It's all coming together. Assuming we don't lose power all day tomorrow, it should all be done by the end of Sunday night. Either way, it'll definitely be printed up and available for ordering by the end of next week. Hang in there everyone, I think this one's going to be worth the wait! Ryan Claytor's got pinball fever! Many years ago, at a long-forgotten comic convention I met a very friendly guy named Ryan Claytor. Ryan leads a very similar life, when compared to Jon and I. 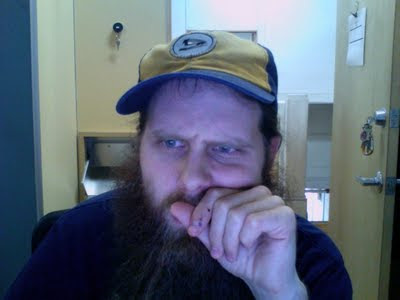 He self-publishes his own minicomics and like us, he teaches comics, though at Michigan State University and The University of Michigan Flint. But the similarities don't stop there, because recently Ryan has been getting REALLY into pinball! He recently posted a list of the top five most enjoyable educational and/or helpful pinball resources that he has found in recent months. I'm proud to say that Drop Target was his #1 resource! 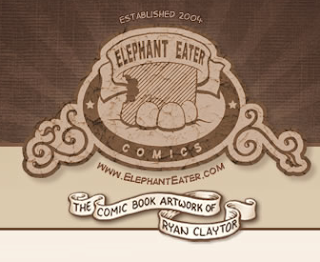 This summer Ryan went on a tour, promoting his excellent Elephant Eater comics, and he is now posting entries from his tour diary, which also include all of the pinball machines he played while he was out on the road! The first tour post covers Kentucky and Tennessee, and MAN does Ryan manage to find some awesome machines out there! If you are living in those areas, definitely check out this post to make sure you're not missing out on some awesome pinhalls. I look forward to seeing the rest of Ryan's tour diary, so I can learn about some more of the great pinhalls that are scattered across the country. As you can see here, Jon was super busy last weekend, screen printing the covers for Drop Target #3. The number of finished interior pages is starting to climb and we should be done with the issue in a few weeks. If all goes to plan, we will be debuting DTZ#3 at the Small Press Expo in Bethesda, Maryland on the weekend of September 10th and 11th. In pinball news, over on the PAPA blog they posted part 1 (of 4) of Classic Game Room's coverage of the 14th world pinball championships, which happened last weekend. I was super bummed I couldn't make it this year, so it's great to see some video of the event. The PAPA headquarters looks like an amazing facility. Hopefully Jon and I can make it down there one of these days. Hey Guys! Things have been ba-zonkers here at Drop Target HQ. 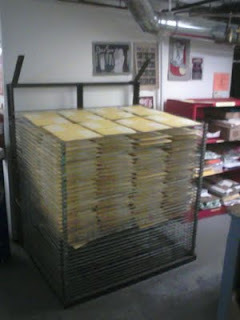 We're getting all our ducks in a row for issue 3, which will be coming out next month. I'll be posting some samples from what we've been working on later this week, but right now I wanted to post a link to a nice review we got from the good people at One Minute Zine Review. You can listen to it here. Thanks, guys! For the last few weeks Jon and I have been teaching at the Center for Cartoon Studies Summer Workshops. Today was supposed to be the workshop BBQ picnic, but it was rained out, so instead we hung out inside with the students. As we were sitting around chatting this afternoon, it occurred to me that it was the EXACT SAME circumstances which drove Jon and me into the (now closed) pool hall across the street from the school, two years ago. 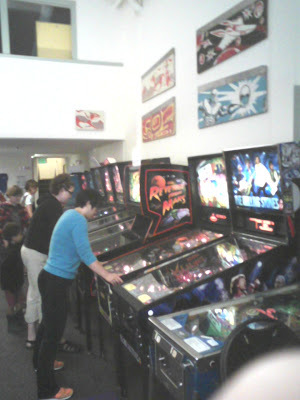 And it was there that we saw the Star Wars: Episode I pinball 2000 machine, which we became totally obsessed with. It's hard to believe it's only been two years! Since then we've become fairly good pinball players, we each own a pinball machine and have both learned a lot about fixing them up. 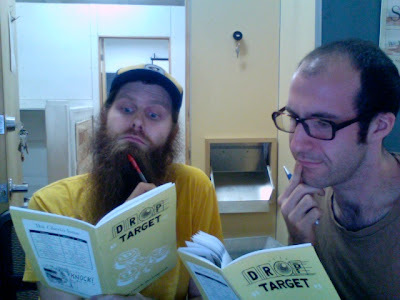 We also put out two issues of Drop Target. Speaking of which, we are both rocking and rolling on issue three which should be out for SPX in mid-September. Jon's already knocked out a big stack of pages and we're both working on Dream Machines and some of the spot illustrations. It's exciting to be putting together a new issue. It promises to be a good one! Until then, good luck to everyone who will be playing in the PAPA Pinball World Championships next weekend! Claire and I just got back from a week-long trip to Seattle, where we spent some time with my family and saw her friends Jon and Dana get married. 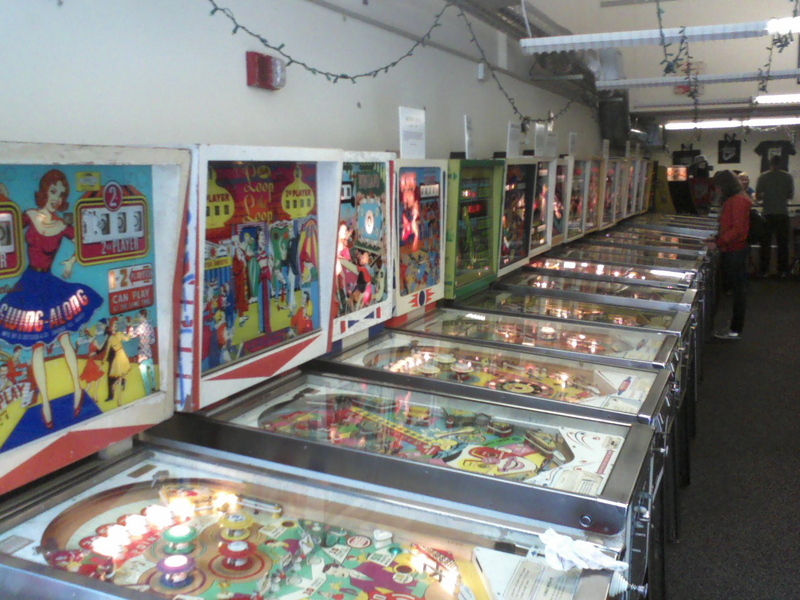 As ever, I had one eye open for pinball machines while we were wandering around SeaTown. Next we went around the corner to the Fantagraphics Book Store where Claire and I and Liz Prince (who was also on the trip) bought some books and records. 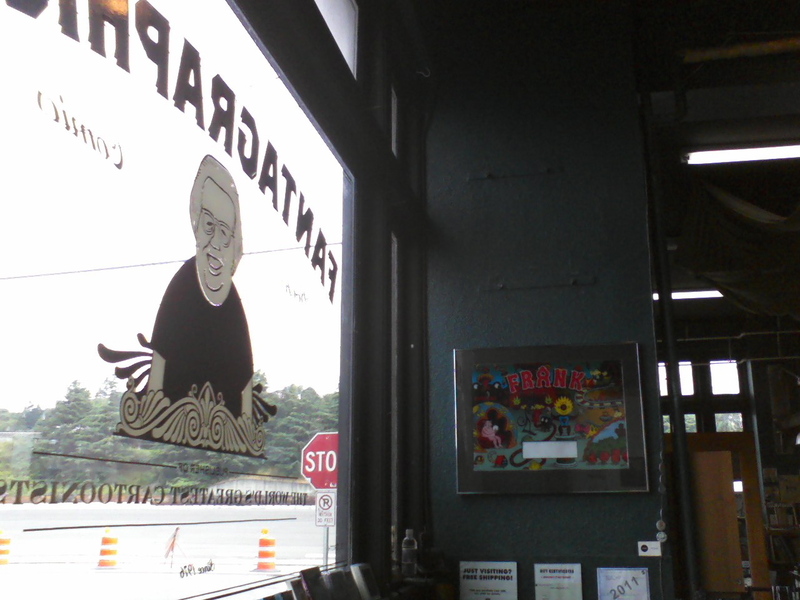 As we were leaving the store I noticed that they had one of Jim Woodring's FRANK backglasses on the wall, which we have blogged about before. It was so cool seeing one in real life - it looks GREAT! I hope someone will build the whole machine. 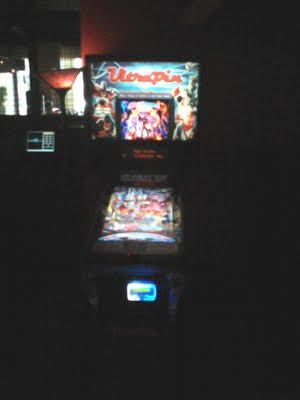 The basic idea of an Ultra Pin machine is that there is a giant video game in the shape of a pinball machine. The "backglass" has a monitor in it, which can display an image of a real backglass and a dot matrix display (or alpha numeric display) emulator. The "playfield" is actually a giant flatscreen monitor, which can be set up for about ten different pinball machines. Supposedly the machine is rigged to respond to bumps and nudges. I bought two credits ($1 for the credits, $2 for the card which carried the credits - UGH) This was my first time playing video game pinball, so I set the machine to Medieval Madness so I could compare it to my own real MM machine, or the MM I played at Shorty's less than 48 hours before. In my humble opinion The Ultra Pin is a giant pile of digital crap. It seems like something a video game company threw together overnight, using a bunch of 20 year-old programmers who have never played a real pinball machine in their lives. The (ENTIRELY DIGITAL) flippers were somehow LESS responsive than real mechanical flippers (??!) and had a crazy 0.5 second delay that made gameplay almost impossible. Also the playfield was stretched and squashed to fit the monitor, screwing up all of the trajectories of the shots. The flippers flipped up way too high and the machine did NOT respond to bumps and nudges. Also the slingshots did not behave like ANY pinball machine I have ever played. Bounces that clearly should have fired them did nothing. I could go on and on, but you get the idea. It totally sucked. It is not pinball. Not even close. I'm pretty sure most of my gripes could be fixed by simply consulting someone who has actually PLAYED these games in real life. Hopefully this company will do just that and improve future versions. As it stands now, it's a real shame that Williams signed off on this project and allowed its creative property to be misused like this. You would hope they would have gotten to test it out. I can't believe they did, or some of these problems would have been fixed. I will never play an Ultra Pin again. I'll save my $3 for a real pinball machine, thanks. That night we had the rehearsal dinner, which coincidently was at a pizza restaurant in Georgetown, across the street from The Mix! I headed back in at got a 287,000 on Charlie's Angels (hit all the drop targets at the top and on the right, plus got all the top lanes, which felt good). 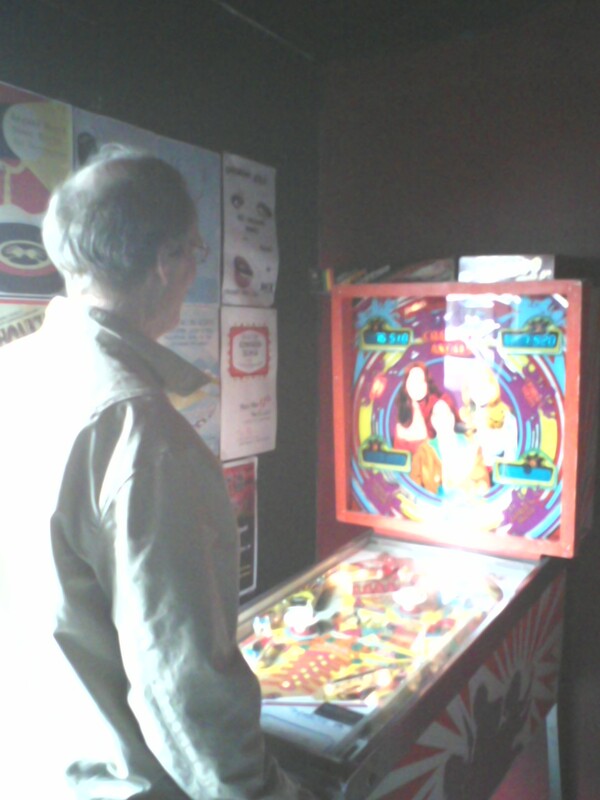 Then on Saturday, I dropped Claire and Liz off for pre-wedding stuff and headed back to Shorty's where, after an hour of trying I finally got a replay on Tron on my very last game. I also got a match, but had to leave the two credits for some other pinhead. I had to get to the wedding! On Sunday, which was our last day in Seattle, I finally made the trip down to the Seattle Pinball Museum, which was EASILY the pinball highlight of trip. I have added it to our "PINHALLS" list on the right sidebar of this blog so you can easily find information for it next time you are in Seattle! 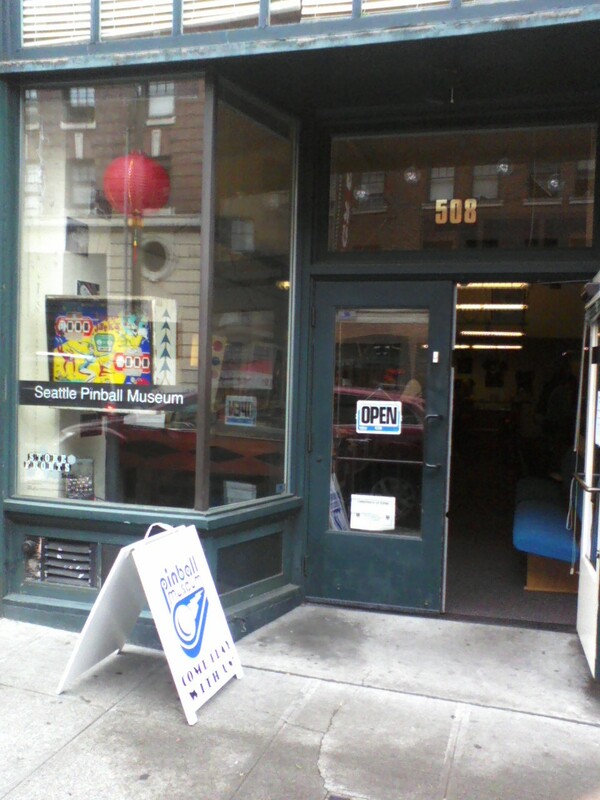 Here is the entrance, with a sandwich board out front so you know what awaits you inside. This is only a few blocks from the International District bus/light rail stop. It's a $7 admission fee and then all the machines are set to Free Play. Inside the machines are lined up in chronological order, by release date. This first wall was mostly elecromechanical machines, and a lot of them have information cards on top of the back boxes, so you can learn more about the machines. I went right down the line and played them in order. It was really cool seeing how certain innovations were introduced and how the designs got more and more complex. I also finally got to play Four Million B.C. which is the first game I've played with "Zipper Flippers" which close up the center drain gap when you hit a certain target. Super fun! On the other wall were some games with alphanumeric displays, all the way up to modern day Stern machines (I played everything except Rolling Stones). You can also see the upstairs area in the above photo, which I got a tour of during my visit. 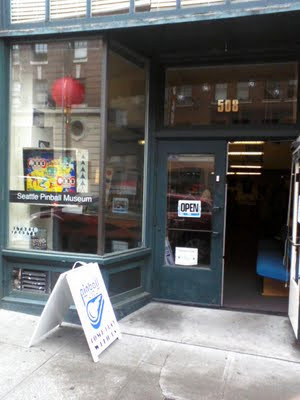 I gave the owner some copies of Drop Target #1 and #2 which he seemed to really dig, so he showed me around the museum and told me about his plans to expand into the upper level with some more machines. Lastly I took this photo of some great side art from old machines. 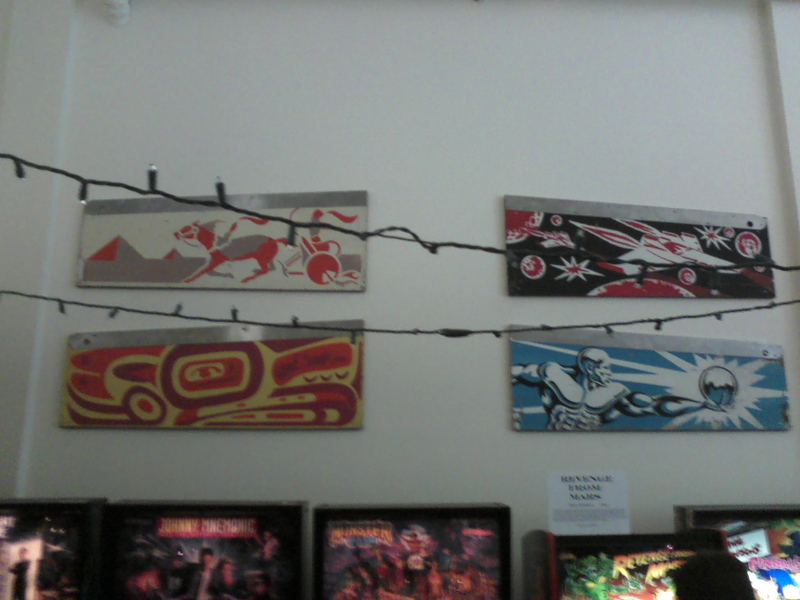 The Seattle Pinball museum also had a ton of backglass art hanging on the wall, which was great to see. This place already has an awesome start and it sounds like it is just going to get better and better. The staff was super friendly and there were a ton of families and kids in there on Sunday. I hope this place will be around for a long time so I can visit it every time I come home to Seattle to visit my folks. If you are in the area, I HIGHLY recommend swinging by to check it out! Claire and Liz and I had red-eye flights back to the east coast on Sunday night. 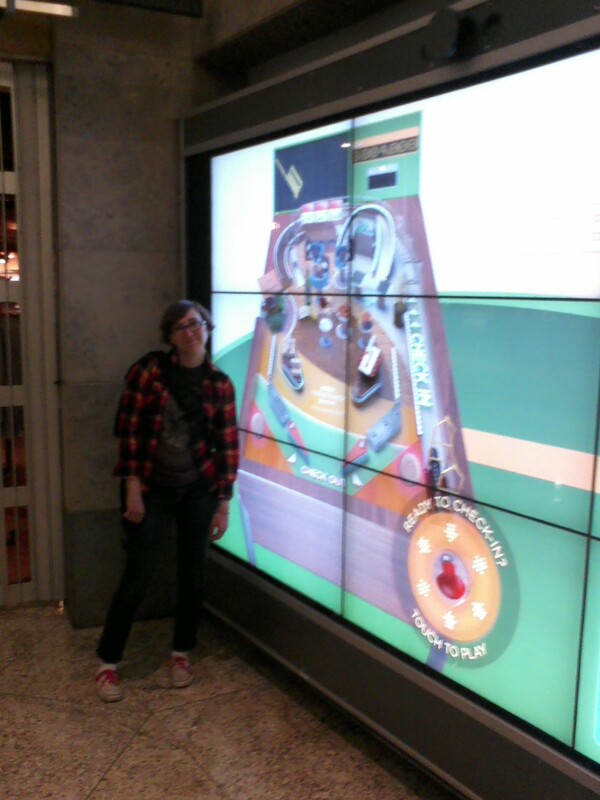 At the SeaTac airport we saw one of those interactive wall screens that was running a hotel ad in the form of a playable pinball machine, with the theme of a hotel lobby. It played about as well as the Ultra Pin, with a second-long delay between when you touched the flippers and when they flipped. As you can see, Liz was not amused. The graphics were pretty neat I guess, and it's cool that a major hotel chain would think to use pinball to promote their services, but I am officially super NOT into video pinball. Claire and I flew out of Seattle at 1am and landed in Minneapolis three hours later. We only had a 20 minute layover to catch our flight to Boston, which was on the other side of the airport. As we were dashing along a moving walkway I saw a small arcade area with THREE pinball machines (Nascar, the Stern Indiana Jones machine and... one other one I couldn't make out). It was heartbreaking... Finally, an airport with pinball, but no time to play! Next time Minneapolis, next time!